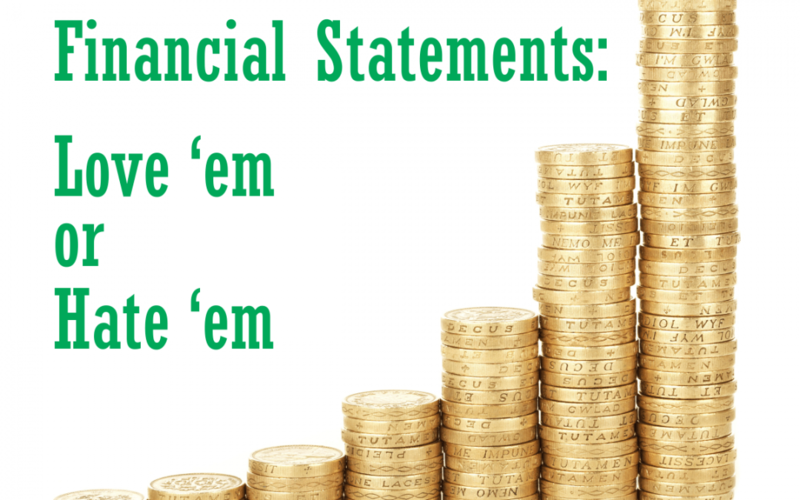 Financial statements…every business produces them…or should. Some are prepared monthly, others quarterly. Some might even be prepared only annually. Of course, the more frequently, the better. Financial statements can have either a love or hate relationship with small business owners. Those who understand the true treasure of the information embedded in financial statements love them. On the other hand, business owners who fear the numbers and find financial statements full of mysteries hate them. So, the group of owners who understand the “numbers” know that financial statements when prepared correctly and timely can be a tremendous asset to a business. Conversely, those who fear financial statements can actually be hindering their businesses by not using the financial knowledge to drive their businesses forward. Which group do you fall into? Financial knowledge is a powerful tool that enables business owners to use what happened in the past to improve upon the future. Rather than only reacting to something that already occurred, correctly analyzing financial statements allows an owner to make proactive, forward-thinking decisions. Certainly, financial statements are a conglomeration of numbers neatly printed in an orderly format. Financial statements, however, are much more than mere numbers. They tell a complete story about a business. When the right questions are asked, information is revealed about a business that goes far beyond revenues and expenses…and assets and liabilities. The numbers tell how a business is operated, what produces a profit, if goals are being met, or what might be changed in the future to improve performance. How does a particular expense affect revenue? Did a particular marketing campaign affect incoming traffic or phone calls? This was an action, what was the effect? Amazing the information contained in financial statements only for the asking! For a small business owner always pressed for time, a decision has to be made when should financial statements be prepared…monthly, quarterly, or annually? “If I’m not going to read them, why should I prepare them?” Good question. Of course, financial statements should be prepared monthly and read! It’s like a book sitting on a shelf with the cover never being opened. No one knows what’s on the inside. It’s the same with financial statements. Even when prepared monthly if not reviewed, the small business owner never knows the treasures on the inside. What are sales increases and decreases attributed to? How is an advantage over the competition achieved? Have marketing efforts been defined for different markets? Does my business have the capacity to grow? Are marketing dollars producing the desired results? Can some expenses be reduced while at the same time increasing efficiency? Let financial statements become a friend to your business rather than a foe. Don’t become overwhelmed with numbers. Take one account at a time, review it, analyze it, and take appropriate action.